A landmark history of Australian Jews in the military, from the First Fleet to the recent war in Afghanistan. Over 7000 Jews have fought in Australia’s military conflicts, including more than 330 who gave their lives. 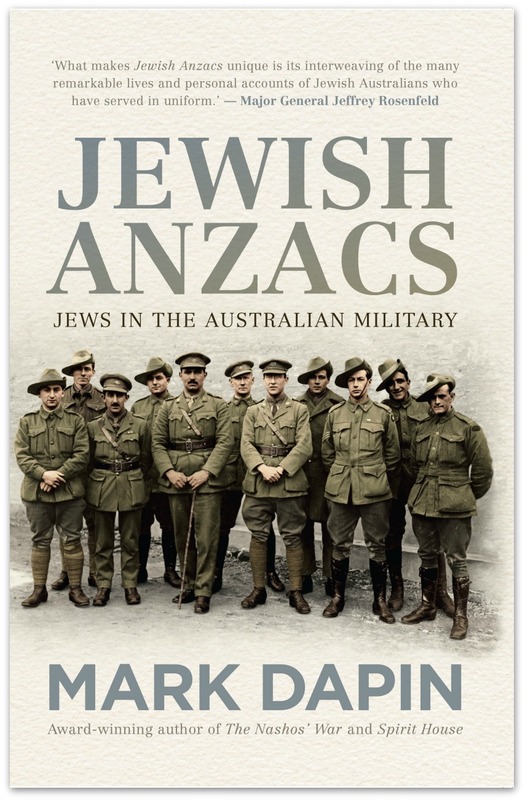 While Sir John Monash is the best known, in Jewish Anzacs acclaimed writer and historian Mark Dapin reveals the personal, often extraordinary, stories of many other Jewish servicemen and women: from air aces to POWs, from nurses to generals, from generation to generation. Weaving together official records and interviews, private letters, diaries and papers, Dapin explores the diverse lives of his subjects and reflects on their valour, patriotism, mateship, faith and sacrifice. Listen to Mark talk about Jewish Anzacs on ABC Radio National’s Sunday Extra HERE and The Spirit of Things HERE. Read Mark’s essay “Unknown Soldiers: Australian Jewish National Servicemen in the Vietnam War”, first published in the Australian Jewish Historical Society Journal, Vol. 23, Part 1, 2016. HERE.